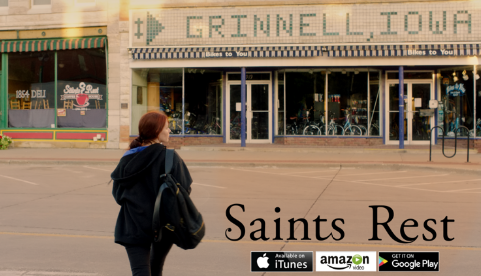 Saints Rest, the movie that was filmed in Grinnell during the summer of 2016 and is largely about Grinnell, will be available for purchase through services such as iTunes, Amazon Video, and Google Play beginning May 18, Noga Ashkenazi, co-writer and director of the film, recently announced. In addition, Grinnellians can preorder the film and the soundtrack beginning May 1 on iTunes at a discounted price, Ashkenazi noted. Since completion of the film, Ashkenazi and co-writer Tyson Stock have shown Saints Restat several film festivals and have garnered impressive results: Audience Choice Award at the RiverRun Film Festival, Best Feature Film at the Iowa Independent Film Festival, and Best Cinematography at the Midwest Independent Film Festival. Many Grinnellians viewed the film when Ashkenazi and Stock brought Saints Restto Grinnell during the summer and fall of 2018. Soon, starting in May, people can buy and view the compelling musical drama at their leisure. More details about the digital release of Saints Restwill be coming in Our Grinnell later this month.